Are you the silent, analytical friend? Perhaps you store facts in your head and can reel them off at a moments notice? Hey, you never know when you’re going to need them, right? Your family may call you ‘shy,’ ‘smart’ or ‘cerebral.’ Well, we have another identifier that you just might like: The Observer. Type 5’s on the Enneagram often fly under the radar, only to come up with some of the most brilliant and unconventional ideas and discoveries of our time. In fact, they belong to the same personality type as Albert Einstein, Facebook’s Mark Zuckerberg, and J.K. Rowling, the author of Harry Potter. The Observer has a rich inner life, but they can struggle to match their head with their heart, and it can take them awhile to truly open up and connect with others. Once they feel accepted though, they are generous, friendly and very, very thorough. 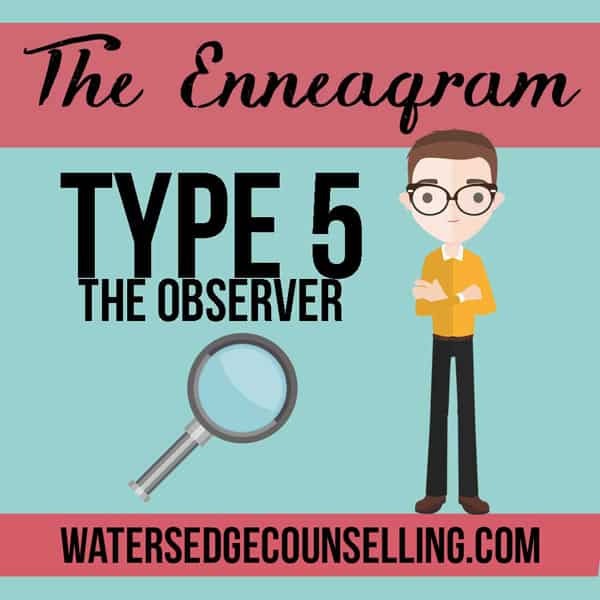 Take a look at our latest infographic on Type 5’s below, and visit our Enneagram page here for more downloads. Keep your eyes out for Type 7, coming soon! Are you a Type 5? Would you like to better understand yourself or the Type 5’s around you? Here’s what you need to do: contact WatersedgeCounselling on 0434 337 245 for a FREE 10-minute phone consultation on how we can best help you, or press book now to book in our online diary.